On 11th of May 2018 we conducted the fifth workshop with children aged 8 to 14 from “St. Paisii Hilendarski” Secondary School, Plovdiv and three children with different types of disabilities: one with chronic tubulointerstitial nephritis and two with intervertebral discs disability. At the beginning Mrs. Grudeva introduced the goals and the ideas of the project to the participants. The exercises started spontaneously with a slight warm up, letting the participants choose the place where the games will be held. 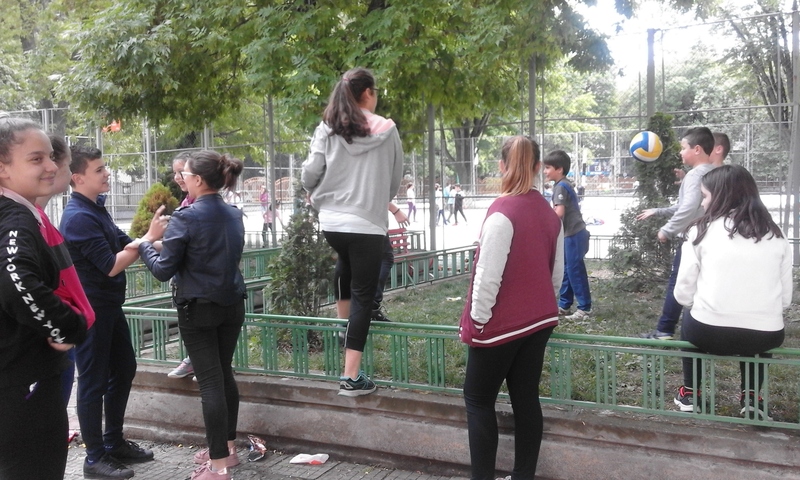 After that, we announced the types of the games requiring movement with the help of the participants and, on their request, the implementation began. We tried not to include a lot of running. We paid special attention to: proper breathing and exhaling during the exercises, the correct posture while passing the ball with two hands, the accurate passing and catching the ball and the sequence of exercising. We spent the breaks between the exercises congratulating the participants with applause and hugs from all the participants. So the children played without being tired and they felt the pleasure of doing sports. All this was obvious from their looks and their desire to continue the activity, leaving their disability behind. We have included games such as: “The Neighbour’s Ball”, “Crows and Sparrows”, “Two Are Few, Three Are Many” and “Ice Statues”. The activity lasted 40 minutes. And it was obvious that the children wanted to play more games. We promised that we would continue with other types of games. The activities ended with a big group hug of all the participants, which showed that the goals of the project were achieved. The event was organized by Mrs. Nina Grudeva and Mrs. Silva Ikimova, as the fifth workshop within the project aiming to raise pupils’ awareness about the benefits of sports.